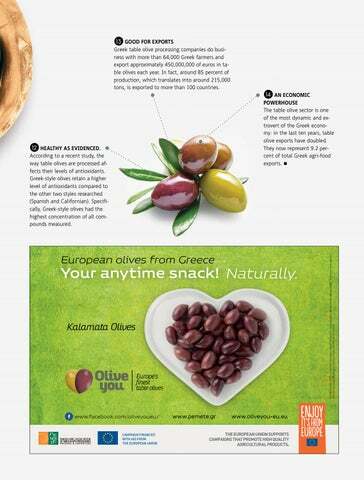 13 GOOD FOR EXPORTS Greek table olive processing companies do business with more than 64,000 Greek farmers and export approximately 450,000,000 of euros in table olives each year. In fact, around 85 percent of production, which translates into around 215,000 tons, is exported to more than 100 countries. 12 HEALTHY AS EVIDENCED. According to a recent study, the way table olives are processed affects their levels of antioxidants. Greek-style olives retain a higher level of antioxidants compared to the other two styles researched (Spanish and Californian). Specifically, Greek-style olives had the highest concentration of all compounds measured.